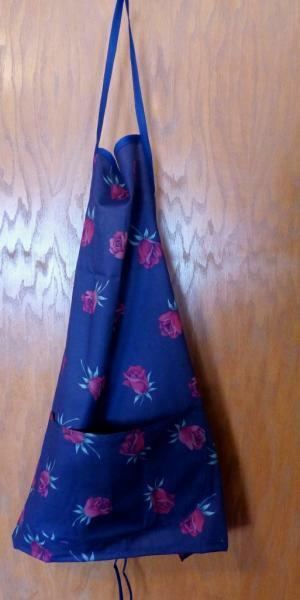 This beautiful apron is made in a cotton blend fabric that is a navy colored background with red roses. The apron easily slips over the head and ties at the waist. There is a handy pocket on the front. It measures approximately 24-25 inches in length from the top of the bib to the bottom hem. One size fits most. It is completely machine washable. This apron sells for $15.00 plus shipping. I will carefully package it to protect it from damage during shipping. Many other styles and colors are available in my store. These make wonderful gifts for others or for yourself. Please review my shop policies before placing your order. Returns cannot be accepted. Thanks for looking!